Okay, so this isn't what the error message actually looks like. But it might as well be. 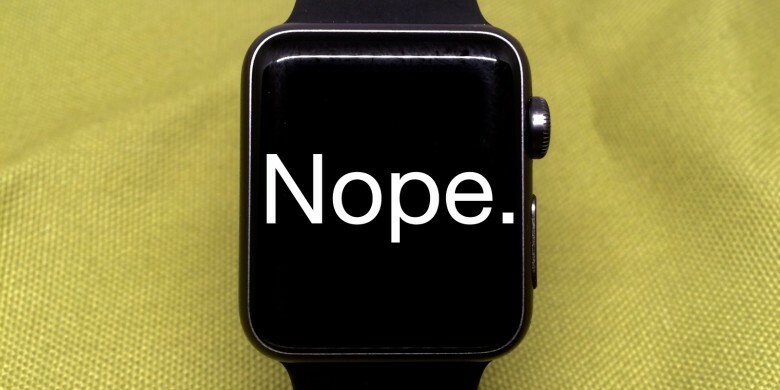 Seven months after its launch, we appear to be seeing a previously unheard-of Apple Watch error, but we think we’ve figured out what it means. Wall Street Journal tech editor Joanna Stern brought the issue to attention on her Twitter account; the screen kind of looks like her Apple Watch had suddenly decided to play a round of retro game Snake. But the actual issue isn’t nearly as fun. We contacted Apple Support for some guidance as to what that Apple Watch error means, and the representative offered some suggestions. The representative said that it was likely a Recovery Mode prompt like that extra-fun message you’ll get on your iPhone when it prompts you to plug the device into iTunes. Possible solutions (in order of severity) are restarting the Apple Watch, unpairing and re-pairing the device with its companion phone, or just resetting the whole thing. Unfortunately, Apple also said that the error could signify a problem with the Watch’s battery. In that case, if the previous suggestions don’t work long-term, people seeing that image will have to make a repair appointment at the Apple Store. And that’s always a good time, right? Meanwhile, Stern has updated with some good news: Her Apple Watch has just magically and randomly turned itself back on. Still, it’s probably a good idea to keep an eye on that.